It's a mere twenty days until the Sweet Pea CAL begins on Friday 4th January, and I'm so thrilled to be taking you on this gorgeous blanket journey. I often find the cold grey months of January and February a struggle and know from experience that having a colourful project to work on at this time of year makes a tremendous difference to my overall sense of well being. The therapeutic qualities of crochet are something I whole heartedly believe in, and if your crochet happens to take the shape of a comforting blanket in gloriously uplifting colours, well that feel-good just can't be beat. This collection of colours honestly makes me soooooooooooo happy, they deliver a soft wave of summer spirit which instantly lifts my mood and makes me feel all kinds of emotional (in a good way). I know many of you have told me in recent weeks that you feel the same way about sweet peas, and I've loved sharing so many of your stories and memories evoked by the colour and scent of these beautiful flowers. It goes without saying that I am beyond grateful to those of you who have chosen to join me in making a sweet pea inspired blanket, thank you, thank you, it means such a lot to me knowing that I'll be in good company as I meander along on my own journey at the start of next year. There is still time to gather in your yarn if you feel like coming along and joining us. Yarn packs sold out incredibly quickly when they were first launched, but more stock was quickly dispatched and there are still some packs available in my shop at Wool Warehouse with worldwide delivery. As I explained in my Introduction post, I've chosen 15 shades of Stylecraft Special DK to create my Sweet Pea blanket. I'm very happy with the way these colours are so well matched to the real living flowers that were my inspiration, they are just beautiful. When you get to squish your own sweet pea yarn, you will need to take a little bit of time making a note of the colours so that you don't get into a muddle with the stripes once the CAL starts. Some of the colours look very similar (cream and soft peach, fuchsia purple and pomegranate, lavender and wisteria) and so even if you are very familiar with this yarn, it's always a good idea to have some visual reference. You can make yourself some yarn pegs like mine, or simply stick some short lengths of each yarn colour to a piece of paper and write down the names for reference. As in previous years, I thought it would be helpful to answer the most frequently asked questions that pop up in the weeks before the CAL starts. Please feel free to ask me anything in the comments below, and I'll do my best to answer. Do I need to sign up to join in the Sweet Pea CAL? The simple answer here is NO, there is no need to sign up or commit to anything. I like to keep my CAL's very informal and relaxed so that nobody feels pressured in any way. All you need to do is gather together your yarn and hooks and join me on Friday 4th January when I'll be publishing the full FREE pattern and tutorial and giving you colour instructions for the first set of stripes. After that, I'll publish a new CAL post here on my blog every Friday (usually first thing Friday morning). There will be 7 installments altogether, running across 8 weeks. Is there somewhere I can ask questions or share pictures once the CAL starts? You can ask me questions here in the comments on my blog and I will always try and answer them personally via email. You can also ask questions on my Facebook page and I will do my very best to catch them all (Facebook is quite tricky for me to keep up with at busy times, but I do try hard not to miss anything). Every week I'll invite you to show/post photos of your blankets in progress on my Facebook page and I'll choose some of them to feature on my blog, so do please share! And lastly, there is a fabulous Facebook group (called "Attic24 Moorland and More") which started with the Moorland CAL in 2017 and is still going strong. This is a very supportive and friendly group where you can ask for pattern help/guidance, share pictures and connect with lovely ladies who are crocheting Attic24 blankets all over the world. Just to mention that this isn't a group set up or moderated by me, although I do pop in most days. What size blanket will I be able to make from one yarn pack? One Sweet Pea yarn pack contains 15 x 100g of DK weight yarn. In my experience of blanket making, this is usually enough to make a single bed size blanket measuring 120 cm x 180 cm (approx. 4ft x 6ft). I'll be giving advice about gauge and tension in my tutorial so that you can decide on the correct hook size to suit the way you crochet. If you follow my advice and make a blanket the same size/tension as mine then you shouldn't run out of yarn! Will there be enough yarn to make a border, and what sort of border will it be? If you are using the Sweet Pea yarn pack and following my colour order, the design will allow for enough yarn to make a border. At this time I'm sorry that I can't give you the exact colours I'll be using for the border, but I'll try and give you this info in good time so that you can check your yarn quantities. What if I want to make the blanket larger, to fit a double bed? If you wish to make a double bed size blanket, you will need to buy two yarn packs. When I publish the pattern, I'll give guidance about the starting chain and pattern repeat so that you can work out exactly how wide you wish to make your own blanket. I'll give exact numbers for you to work either a 6ft or 7ft wide blanket, but once you know the pattern repeat you can work out your own starting chain if you wish. I'll also give numbers and guidance for those wishing to make smaller baby blankets or lap blankets. There will be an extra set of stripes given at the end of the blanket if you wish to add extra length. What hook size do I need? This is a tricky one to answer up front as the hook size you use will very much depend on your own personal hooky tension. The standard hook size for Stylecraft Special DK yarn is 4 mm. However, you can use bigger or smaller hooks depending on your own personal tension. For example, I'm a tight crocheter so I'm making my Sweet Pea Blanket using a 4.5 mm hook. If you crochet quite loosely, then you will probably find that dropping to a 3.5 mm or even a 3 mm hook will give you the correct gauge. This pattern works better if your stitches aren't too loose and baggy - a slightly tighter tension/smaller hook works best. I prefer coastal/pastel/bright colours, do I have to use the Sweet Pea yarn pack for this blanket? The main aim of a Crochet-A-Long is for us all to join in and make a blanket together, and it doesn't matter what colours you choose so long as they make you very happy. Of course I'd be thrilled if you decide to join me on my sweet pea journey, but if you'd rather use one of my other blanket colourways or create your own unique palette, then that's absolutely fine too. You mentioned that you would be sharing two different colour orders for the CAL, can you show us what you mean? Last year when I designed the Woodland blanket, I decided to give two colour options for making the blanket - one was my trademark "colour story" and the other was a simple random stripe. With the Sweet Pea blanket, I always intended for the stripes to be random (well, what I call "planned random" as there is an element of considered design involved). I want the blanket to give the visual impression of a hand picked posy of sweet peas where all the pastel and bright shades come together in a happy, random medley of gorgeousness! You can see in the photo above the effect that I'm after - it's joyful and vibrant, and has a really happy energy about it. The more familiar I became with the colours, the more I began to think about the idea of creating an alternative blanket, where the stripes are arranged to create a very harmonious colourwash effect. I know many people find a colourwash placement very easy on the eye as there is s a natural order (based on the colour wheel spectrum) which our brains perceive as calming and relaxing. ....and you can see my two crochet colour samplers up above which show both the Posy and the Colourwash designs. I wanted to give you a heads up about this so that you can ponder on it during the next few weeks and decide which one you'd like to make. Posy or Colourwash???? I wonder which will be the most popular?! One thing to consider - you won't easily be able to alter the number of stripes in the Colourwash version, so this will be a blanket measuring 6ft long. If you want to make a longer (or shorter) blanket, you'd be better to go with the Posy version where you can easily adjust the number of stripes. I hope this isn't going to throw you into a fit of indecision - this isn't my intention at all, and I promise you that both blankets are equally lovely. Let me know your thoughts in the comments, I'd love to know what you make of this idea?!! Is the Sweet Pea blanket a suitable project for beginners? Yes, yes, YES!!!!!!!!!!!!!!!!!!! This really is the perfect blanket for newbie hookers to have a go with, and I've designed the pattern especially with beginners in mind. So long as you can maintain a fairly even tension and work double crochet and treble crochet (UK terms), you will be able to do this. The Trellis Stripe pattern is deceptively simple but produces a beautiful soft finish, and the crochet itself, oh.....................it is DIVINE!!!! It's rhythmic and soothing, an easy repetitive pattern with next to no counting so you can look forward to hours and hours of relaxing hooky satisfaction. As usual, I'll be making one of my full tutorials with loads of photos to help you every step of the way. One thing to mention - the Trellis Stripe is highly addictive, and super speedy too. I'm just giving you a little warning, it's particularly hard to step away from this one!! I'd really like to practice the Trellis Stripe pattern before the CAL starts, what can you recommend? The hardest thing about crocheting a striped blanket (especially for beginners) is working that first dc row into the foundation chain. For this blanket I'm working the first row of UK double crochet into the single/top loop of the chain (shown above), so this is something that you can practice in advance. Try experimenting with going up a whole mm in hook size to make your chain, then dropping back to a smaller hook to work your first row of stitches and see if this makes it easier for you. The other thing you might like to try is creating a foundation-less double crochet row (PLEASE NOTE that's UK double crochet = US single crochet). I know many people who've worked my striped blankets have found this approach helpful, although I've tried it and hated it! It's a very personal thing. Remember that if you are searching for information on this technique, please please make sure you know if you are following a UK or a US tutorial (especially if you are on YouTube as it's not always made clear). Will the Sweet Pea CAL information stay on your blog if I want to go at my own pace or make the blanket later in the year? Something I'm very passionate about is sharing, inspiring and spreading my love of crochet, and the patterns that I publish on my blog are always free and available for you to access whenever you want. I have no plans to change this, so you can always find my patterns and tutorials whenever you need them. With my CAL blankets, I am well aware that not everybody has the luxury of time and that the 15 stripes a week might be difficult for some of you - please don't worry! Remember this is all about relaxed enjoyment and even if it takes you a year or more to make this blanket, you will certainly not be alone. You can stop and start, dip in and out as and when it fits, and the pattern and colour info will stay on my blog for you. Having said that, I love the idea of us all hunkering own together at the start of a new year to hook up these colourful stripes together - the CAL will run for 8 weeks in total throughout January and February, with 15 stripes given each week. I'll give you a detailed schedule when the CAL begins. I am so excited for the CAL, the whole idea of our wonderful community coming together all over the world to make blankets for pleasure thrills me on so many levels. It's fun and joyful, but also therapeutic and mindful too. I hope you'll enjoy belonging to the Sweet Pea gang....I'll need to think of a collective name as I can't really call us the Sweet Pea-ers??!!!! where you can add in Attic24 if you've enjoyed using my designs and want to vote for me there too, I'd be so grateful! 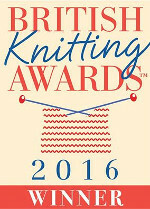 Voting is open WORLDWIDE, although only UK residents are eligible for the prize draw. The crochet section is blessedly short (only 5 categories, yay!) so it's a quick process to add your vote. Voting closes at 11.59pm on Sunday 16th December 2018. Number two, I came across the most amazing flower company last week, and their photography is just beyond stunning. So if you fancy a visual floral feast, do go and visit the Floret Flowers, they are also on Instagram. Be prepared to swoon!! !